Our worldview is shaped by the fact that every business going forward, is going to be more and more a digital business. Microsoft global CEO Satya Nadella says technologists play a key role in the mission to empower every person and every organisation in the planet to achieve more. He says this is the mission of Microsoft that helps guide the company in the choices it makes and the products it builds. 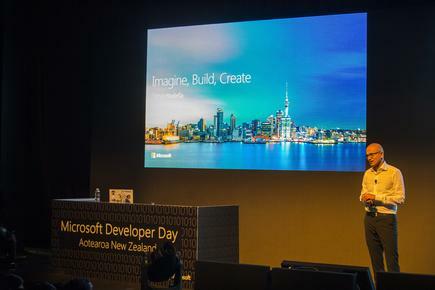 Speaking at the Microsoft NZ Developer Day in Auckland, Nadella cites the impact of rapidly changing technologies. “Our worldview is shaped by the fact that every business going forward, is going to be more and more a digital business. They are increasingly going to have digital content in how they build their products and their services, he says. It is Nadella’s first visit to New Zealand, since the 49-year-old took over as Microsoft CEO from Steve Ballmer in 2014. Satya Nadella at the Microsoft NZ Developer Day at the ASB Waterfront Theatre. Everyone of you can now dream a future, of the impossible, but perhaps in this age when digital technology is so pervasive, you can realise the future that you have just dreamed of. He says when he talks about mobile first, cloud first it is not about mobility of a single device, but mobility of the human experience spanning all the computing in our lives. Five years from now we will have more computers, we may be wearing glasses with computers, with sensors in every room we go to, he says. “We are not just stopping at building blocks,” he says. “We want to make the raw infrastructure in the past that were in supercomputers, available to all developers. “We are democratising AI for every developer,” he says. One of the things we care about is accessibility of our software, he says. It is not just cutting edge devices, but the ability to make a real difference whether in healthcare, not for profit or any other organisation. During his keynote, he mentioned some of the Kiwi organisations he has visited or whose leaders he spoken with. These include Hapara, Surf Life Saving, Ryman Healthcare, Citta Design and Volpara. Volpara software is a cloud-based solution that enables breast imaging centres to perform rapid-quality control checks to optimise the productivity and efficiency of imaging resources, and thus lower costs through the reduction of retakes, increase staff effectiveness and provide objective evidence to demonstrate compliance and quality of care. The platform of interactive dashboards – built on Microsoft’s Power BI suite of business analytics tools and powered by Microsoft’s Azure integrated cloud-computing services – provide updates with every patient study. It's not ultimately about just our technology...It is about what others can do with our technology. 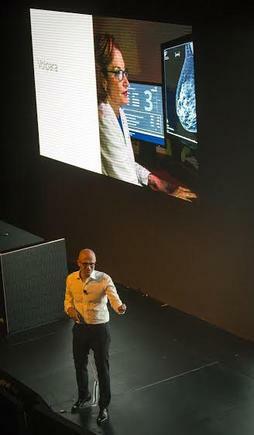 Nadella says the founder of the company believes deep learning and machine learning can “really make a huge difference”, in helping radiologists become more efficient in detecting breast cancer. “Thirty-five percent of breast cancer goes undetected, so bending the curve there can make a real difference in medical outcomes,” says Nadella. “Their dream, of course, is to democratise it, make it available, everywhere in every clinic. 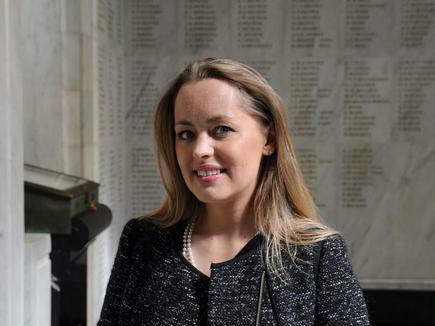 “That dream is so much more possible now because of the advantages in technology. That is ultimately what is the opportunity and responsibility of all of us,” he states. "We think about people, but we think about people building institutions, organisations to even outlast their own presence in those organisations. To us that's a first class software construct even. "We think about technology and its global reach and global access and global impact. 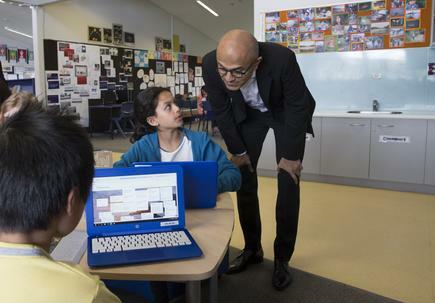 "I am definitely a product of that," says Nadella. "If it [were] not for Microsoft's technology reaching me where I was growing up, my entire story wouldn't have been possible." But perhaps most importantly is it's not ultimately about just our technology, he says. "It is about what others can do with our technology. And when you talk about it in that sense, that's probably where developers are the most interesting conversation to have for us." He says his fundamental call to action is this: “Everyone of you can now dream a future, of the impossible, but perhaps in this age when digital technology is so pervasive, you can realise the future that you have just dreamed of. “Many of you will go on to create the apps, the experiences and the technology that is going to shape our lives going forward." 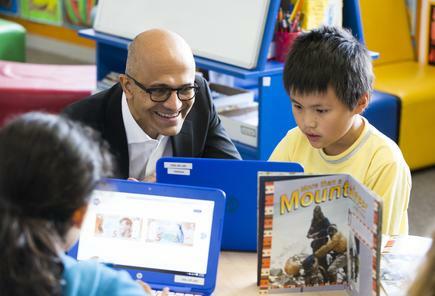 Microsoft CEO Satya Nadella visited the Freemans Bay School as the guest of Education Minister Hekia Parata to see how the school is utilising the CS Unplugged program. For Angie Judge, CEO of Dexibit, Satya Nadella’s message of next generation technology enablement and democratising AI, resonates strongly with her work. Judge is one of the more than 600 delegates to the Microsoft NZ Developer Day and one of the industry leaders who joined in a panel discussion with Nadella. 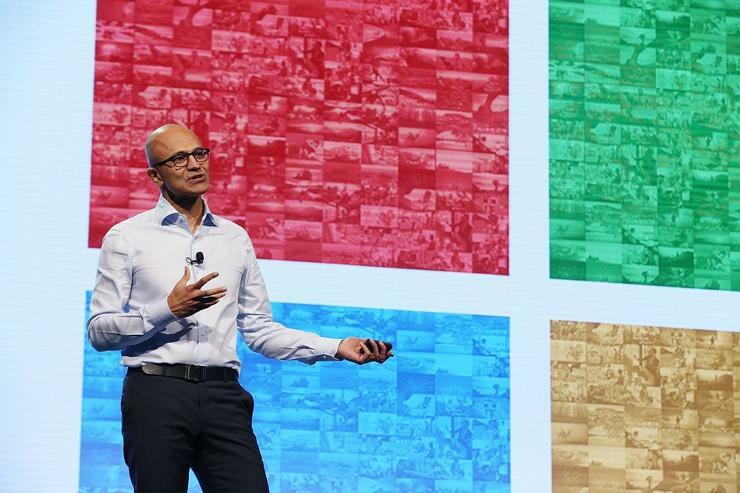 We are starting to think about the bigger world Satya Nadella is talking about. How can we use data to put it in the hands of the people to inspire them to new things? Judge says Nadella mentioned how previously technology has been used to enable consumption. But computing is no longer just about enabling consumption, it is all about enabling creation, she says, citing the themes Nadella explored in his keynote. “That message of creativity is an inspiration for us,” says Judge, whose company provides analytics on visitor behaviour onsite and online, enabling data driven decisions that increase visitation for museums and other cultural institutions. “When we started our journey we were thinking of the smaller world, how can we solve an immediate problem? How can we provide a real-time dashboard? That is really exciting,” she says. Microsoft CEO Satya Nadella at the Freemans Bay School: The Computer Science Unplugged project (www.csunplugged.org) is a collection of free learning activities that teach Computer Science through engaging games and puzzles that use cards, string, crayons and physical activity. The activities introduce students to Computational Thinking (CT) through concepts such as binary numbers, algorithms and data compression, but separated – “unplugged” – from the distractions and technical details of having to use computers. It has received a Microsoft ‘Youthspark’ grant of NZ$343,000 to further develop the programme.